Premium quality & Stylish,rectangular pedal bin E-Cube 20 litre pedal bin with an extra wide step, plastic liner bucket and soft closing lid. The stay-open function is handy for bag changing and cleaning. Ozzes with presences and quality! Keep that corner of your home or office clean and tidy with the space-saving EKO E-Cube rectangular pedal bin. This high quality rectangular pedal bin with removable inner bucket is specially designed with a patented soft-close lid for noiseless use, as well as an elegant brushed stainless steel exterior that's fingerprint resistant. The EKO E-Cube 20 litre pedal bin offers ease, convenience and a sleek contemporary style. 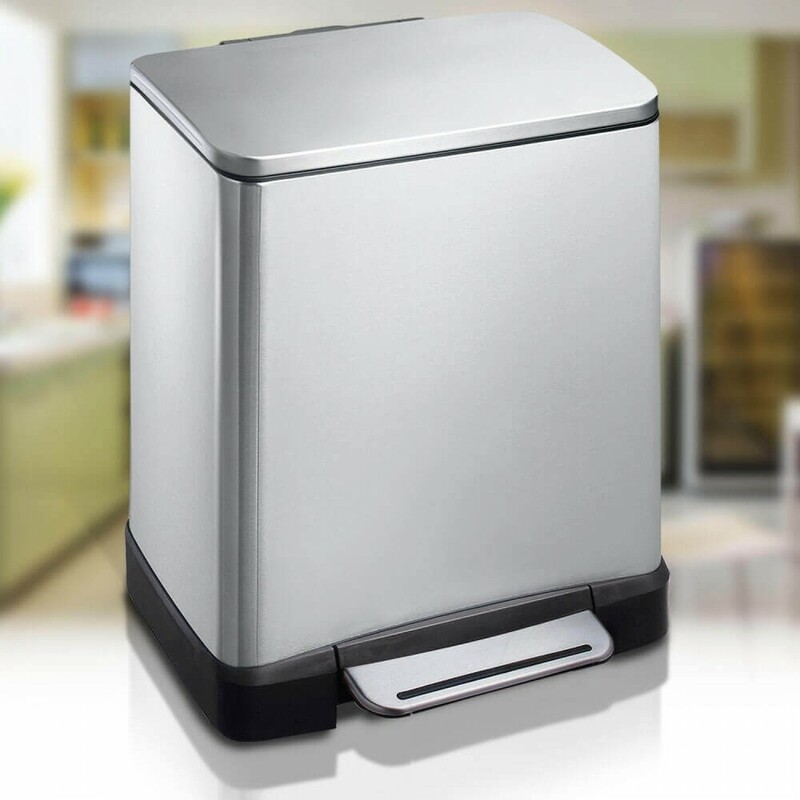 The Eko E-Cube modern style rectangular pedal bin is a great addition to any modern or retro kitchen or bathroom, it has many uses such as food waste, storage or in the bathroom as a sanitary waste disposal bin. The pedal activation is a sturdy long lasting mechanism and the interior boasts an ABS high grade plastic which is removed for emptying and cleaning, you can also use your preferred brand of bin liner or our own quality bags. A real space-saver, the Eko E-Cube 20 litre pedal bin features a wall leaning design to help you save space in the home. This is a rectangular bin is made of tough, durable materials that will last for a long time. The strong, all-steel pedal is engineered to withstand over 100,000 steps, that's more than 20 steps a day. This waste bin has an impressive 20L capacity and has a solid stainless steel lid that won't show dirt or fingerprint marks. The lid also stays open whenever you need it, making it ideal for long chores. The E-cube is shaped flat and has a unique internal hinge allows you to place this bin right up against any wall or kitchen cabinets. This bin can also hide excess bags with its innovative plastic bag fixer, meaning they stay neatly out of sight.